Our 12-seater van carrying the team of Giao Diem volunteers and Americares representatives, zoomed across the bumpy country road, often jerking left or right to avoid oncoming traffic, other times jolting its passengers out of their seats. Branches brushed against our windows as we approached the school, a large yellowed building with three classrooms tucked away in the mountain scenery, beyond stretches of rubber trees and fields of rice paddies. A boisterous group of children ranging from two to six years old greeted us as we slipped off our shoes and walked into their green-tiled classrooms. Their beautiful young faces were alight with energy and curiosity. These children were just a handful of over 3,500 students that Giao Diem Humanitarian Foundation serves in their Pediatric Nutrition Project across the most impoverished provinces in Southern and Central Vietnam. A non-profit based in California, Giao Diem Humanitarian Foundation has been providing humanitarian services in Vietnam, from disaster relief to supporting hospitals and orphanages since 1991. But this particular pediatric nutrition project began seven years ago as the brainchild of Dr. Thuy Thi Nguyen, the project director and fervent advocate of children’s health and nutrition. Aiming to meet the United Nations Millennium Development Goal of malnutrition rates, she along with Dr. Hong Nga (based in Ho Chi Minh City) developed a program that provided children living in impoverished areas of Vietnam two glasses of peanut-fortified soymilk, locally made by the teachers’ aides, every day during the school year. With the immeasurably important support and cooperation from local supporters, friends and associates in Vietnam, and the hardworking teachers, principals, cook-aides, parents and community leaders, this project has gained success, expanded both geographically and in its project aims and is moving steadily towards the direction of self-sustainability within a number of classrooms in central Vietnam since the beginning of the last school year. Giao Diem could not have undertaken this formidable program improving the nutrition of thousands of children in rural Vietnam without the support of Americares Foundation and Abbott Fund. As with the previous schools in Quang Tri that we visited prior, Tammy, Ryan and Emanuela from Americares helped distribute locally made, green hooded fleece jackets to every child in preparation for the cooler seasons later in the year. 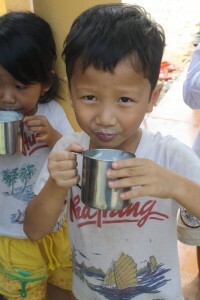 They as well as the GDHF team met with the local administrators, teachers, and cook-aides, tasted the rich soymilk made fresh for the children at the school and discussed ways in which the school needed more support – whether it be the construction of a new classroom or bathroom facilities, or the financial support of another cook-aide to make soymilk. And while the rest of us were distributing clothing, touring the school facility and engaging with the children, Dr. Thuy Thi Nguyen and local coordinators held a well-attended parent meeting on improving their children’s nutrition at home. It is in this aspect that truly sets Giao Diem apart from other non-profit organizations – the foundation effectively connects and engages everyone in the community who has a stake in and who cares about the future of Vietnam’s children. From the parents who are often struggling with poverty to the devoted teachers and cook-aides who rise at four in the morning to make this difficult recipe to the donors and supporters back in the United States, Giao Diem has not only persisted on this long, seven-year journey – GDHF has gained large success. For the last three years, the Pediatric Nutrition Program has reached the UN millennium goal, reducing the overall malnutrition rate of participating children under 5 years old to below 20%. It is evident, as in this trip, from the healthy faces and active spirits of the children who have participated for several years that they have truly benefited from the nutrition program. As successful as it has been thus far, the Pediatric Nutrition Program is not without its problems. At nearly every school, there are a number of children who, due to multiple factors, remain malnourished year after year of participating in the program. For the last school year, these children have been identified and given special consideration and care, including a breakfast meal at school in addition to their glasses of soymilk and school-run lunch program, and soybean oil to be incorporated in their food at school and at home to increase their caloric intake. This and other issues won’t be solved overnight. But like any effective organization, Giao Diem continues to tackle problems head on while working towards a sustainable future for the project. Starting this June, the foundation will even have a new intern who will be based locally in Hue, helping local project coordinators, gather monthly data (the progress of children’s height and weight) as well as help organize seminars and meetings. Waving farewell to the children, parents, families and teachers at Linh Thuong, we left this school with warmth and emotion in our hearts. It is truly amazing to see the positive difference a small group of people can impart on this community in Quang Tri, and in the other communities in Hue, An Giang, and Ben Tre provinces. We cannot wait to see them again this coming July at the annual nutrition and health education seminar for teachers and principals!